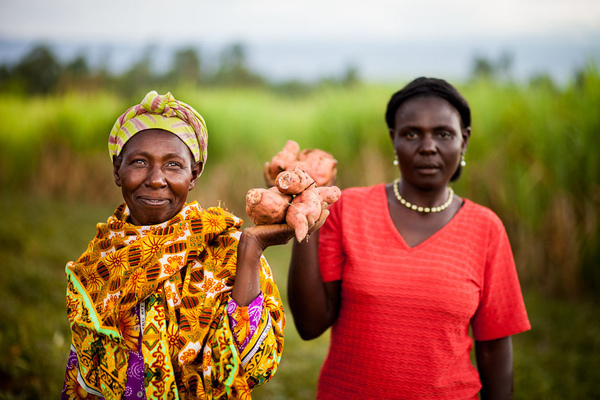 Through a Feed the Future project in Kenya, smallholder farmers, particularly women, are introduced to high-value crops such as orange flesh sweet potatoes that can both boost household food security and increase incomes. Credit: Fintrac Inc.
WASHINGTON, Jul 27 2013 (IPS) - In the face of global climate change and currency devaluation, improved strategies are being used to combat high international poverty and malnutrition rates, and to increase global food security. The administrator of the the U.S. Agency for International Development (USAID), Dr. Rajiv Shah, this week announced two new innovation labs at Feed the Future, the U.S. government’s global hunger and food security initiative. One of the recently announced labs, the Feed the Future Innovation Lab for Collaborative Research on Sorghum & Millet is a partnership between the organisation and Kansas State University. The lab will attempt to find new technologies and techniques for smallholder farmers to use in order to ensure that their productivity of grasses raised for grain, including sorghum and millet, increases in times of climate change. “The perspective from us is that we think the emphasis that has been given to agriculture is critical, not just for food security but for economic development and growth in developing countries overall,” senior policy advisor on agriculture and food security at the advocacy organisation Oxfam International, Eric Munoz, told IPS. The second of the two new labs, the Feed the Future Innovation Lab for Food Security, is a partnership with a number of universities including Michigan State University and the University of Pretoria. The lab will attempt to improve food security policies and increase private sector investments to support smallholder farmers. “The food security policy innovation lab is intended to increase the body of knowledge and understanding of the best way to go about influencing policy and what the best ones are to accelerate the impact that we are trying to achieve,” the food policy advisor for USAID’s Food Security Bureau, David Atwood, told IPS. Both of these labs will focus on Senegal, Niger and Ethiopia. Launched in 2011, Feed the Future issues annual reports analysing progress during the fiscal year. The reports outline overall goals for 2015 and yearly targets along the way. “The programme is still just a couple years in so we are starting to see some nice results, especially on nutrition,” Katie Lee, advocacy and policy coordinator for international development at the alliance of nongovernmental organisations InterAction, told IPS. According to the report, Feed the Future has met the majority of the goals it set for fiscal year 2012 in terms of who is receiving aid and how it is benefitting them. Leaders at the organisation say that they put more of an emphasis on providing food aid to women. “Women tend to invest more in family and child education and health, so investing in women can really help take the whole development effort a long way,” Atwood told IPS. According to Feed the Future, women make up 45 percent of the agricultural labour force in developing countries, and if they were given the same access to land as men, their agricultural output could potentially reduce the number of hungry people in the world by 150 million. In 2011, Feed the Future supported a group of 65 female farmers in Ghana for five months by training them in record keeping, planning and management. The group was eventually able to buy new technologies to increase their rice production. By fiscal year 2013, Feed the Future hopes to see over 15 million rural households directly benefit from U.S. government intervention, over eight million people apply for technologies or management as a result of intervention, and over 13 million children under the age of five have access to U.S.-supported nutrition programmes. “We want to ensure that when American assistance touches the lives of the hungry, we help them immediately and help them stand on their own two feet in the future,” said Shah. locally-serve globally, initiative local-outcome global. targets and 31 quantitative indicators. Our Bangladesh identified as the most vulnerable to climate threat. Minimum 50 million people will force to evacuate their home. And 200 million people will be displaced due to climate change and natural disaster by 2050, according to Refugees International. Could we ponder how, where those will be settled? We must get each person caring to the each particle of food, resource. sasrai ONLY THE PATH TO SAVE MOTHER PLANET EARTH, NATURE. considering earth, environment and humanity. living below the high tide line by 2023.
would likely spare hundreds of cities, including many major cities. Should you have any query feel free to contact.